With Venus sextiling Jupiter today it is only fitting to see the card of Temperance weaving the magic of her dance whilst delivering to you a vision of how you would like your life to be. Today is a day where you may dream and if you turn yourself over to the process of dreaming of what you want then don’t do it in a small way… make the dreams big! 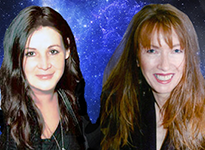 With Venus and Jupiter sextile there is the implications that your dreams of the romantic nature and with the luck Jupiter usually bestows being in harmony with Venus, planet of love, your are sure to be having positive thoughts and feelings alongside big ideas on how to capture that which is closest to your heart’s desire. There is a certain amount of balance in this card where your cup is neither full nor empty. You have one foot in and one foot out of a situation but are not fully immersed in the outcome which leaves you room to change your position. Emotionally you are balanced, you feel centred and at peace. If you have decisions to make today is a great day to make them as you are not being pulled in one direction over another. The bright pink wings speak of love… the kind of love that is exciting and dizzying. Whichever path you decide to go down it is a win/win for you. If you choose to move forward onto the embankment with the green reeds growing you step into a new direction but one that is full of growth. If you stay where you are and decide to continue in that situation the water under your feet will bolster your emotions and the road behind you, from where you have journeyed before in this situation is now calm and welcoming. Whatever you choose… the choice is all yours. 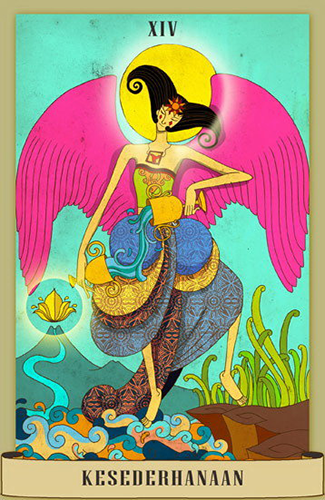 The card used for today’s tarotscope — Temperance — is part of the Indonesian Nusantara Tarot series created by Hisyam A. Fachri. Hisyam Fachri is a professional trainer, clinical psychologist and hypno-therapist in Yogyakarta, Indonesia, who uses the tarot as part of therapy in his private practice. In addition to the publication of this deck, he has also written The Real Art of Tarot, The Real Art of Hypnosis, Tarot Psychology and Tarot Past, Future & Life. This deck is based on the Jungian concepts or synchronicity, archetypes and the collective unconscious. It is currently out of print, but there are several Youtube videos that are definitely worth watching.